Take a look at Clare School in action. 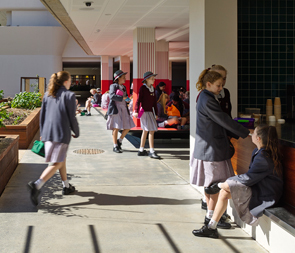 Year 9 students must continue the study of Religious Education, English, Mathematics, Science, Study of Society & Environment, and Health & Physical Education, but choose elective units according to their abilities, interests and future study and career plans. Year 10 is a transition year where students are able to develop skills and knowledge to enable them to make appropriate choices for senior study. They are guided in their subject selection and course planning with individual interviews for students and their parents, information evenings and detailed subject handbooks. Religious Education, English, Mathematics and Science are compulsory, with students able to make three other choices each semester to complete their program of study. If they are keen to study Music and Languages in the Senior Years, they are encouraged to study these subjects for two semesters.